The Grand Cayman is known for its glitzy shopping mecca and fabulous resorts that line the white-sand seven-mile beach. With complete relaxation on offer, it comes as no surprise that exquisite dining establishments would be on the menu, along with breathtaking views and exciting nightlife. 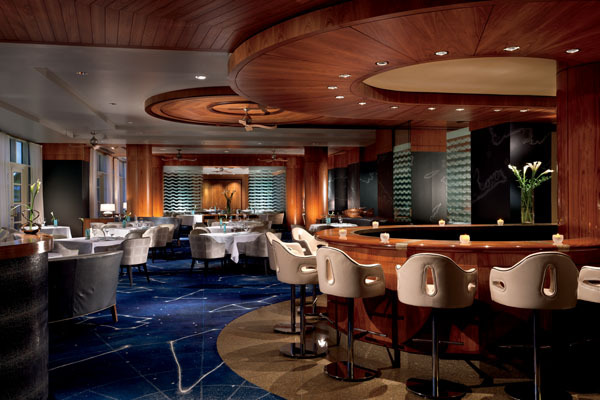 Surrounded by the sparkling azure waters of the Caribbean Sea, the Grand Cayman serves as the perfect location for sophisticated seafood restaurant, Blue by Eric Ripert, situated inside the Ritz Carlton Grand Cayman hotel. Formerly a chef at the iconic Le Bernardin in New York, Eric Ripert swapped the hustle and bustle of a busy city, for ocean views, calming waters and pineapple cup cocktails, topped with those cute little umbrellas that sit on the side. 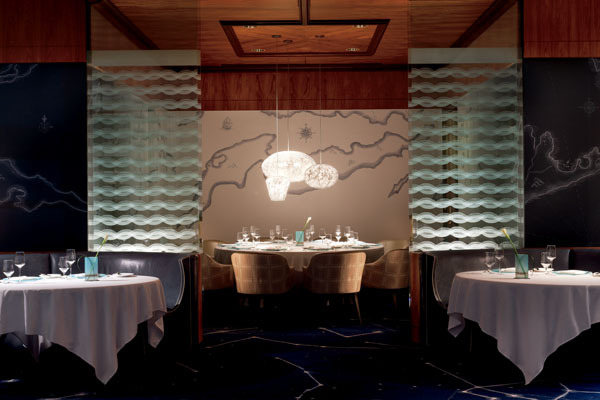 Indisputably, Grand Caymans distinguished restaurant Blue by Eric Ripert is where the wanderlust travellers and local Caymanians go to be dazed by the true epicurean artistry in the grand tradition of Le Bernardin. Guests are treated to a Las Vegas Style dining experience with Michelin-quality food being the showstopper of this performance. To set the scene we start off with a soothing ambience, which guides you to a soft landing at your table. While you are being guided, the elegant décor jumps out and introduces itself. The varnished wooden ceilings are polished and sleek and pair well with the ocean blue marble floor, which takes you back a couple of hours to when you were swimming in the crystal clear waters of the Caribbean Sea. The chairs and stools are covered in a soft creamy color, which is subtle yet keeps with the elegance of the space. If that was not enough, the lounge area reminds us of something you would see being popular in the Jazz Age, as the bar stools are a lush red color, releasing seductive vibes and luxury qualities. The chandelier hanging in the center, further adds to the opulence, of the extravagant space. We can already see Gatsby savouring a glass of scotch on the rocks with the infamous Myer Wolfsheim, planning his next get rich quick scheme. For the main event, diners can choose a six or seven prixe fix menu, or the famous tasting menu, which offers an array of seafood’s, all prepared and cooked variously. To start off, the Tuna –Foie Grass is Chef Ripert’s delectable baby, which he brought with him from his former restaurant. It is a melt in your mouth dish consisting of thinly pounded local Tuna, foie gras, an incredibly thin piece of toasted baguette topped with oil and chives. From the almost raw section, the caviar is a crowd pleaser, and is the perfect companion to accompany other dishes. The lightly cooked section offers a selection of seafood’s, which have been lightly cooked and served with vegetables, sauces and other condiments. All dishes are presented with exceptional style and quality, encompassing all the aspects of the restaurant as a whole. The wine list is no different, offering over 700 fine wines from around the world; this restaurant comes as no surprise as it is hailed the Caribbean’s only AAA five diamond dining experience.